I first met Henry several years ago while he was a student on a week-long bushcraft course I was teaching. I later got to know Henry better when he returned for further courses covering axe skills, campcraft and more advanced bushcraft skills. When you spend time with Henry, you notice not just his love for the outdoors and bushcraft but also his clear practical abilities. Henry has an affinity for working materials and is a natural with hand-tools. Henry has recently been learning flint knapping and basket weaving. Henry is a designer and works as an architectural modelmaker for architects Foster and Partners. This has given him experience in a whole range of areas. One of these areas – as you will see in the following article – is woodwork . This is Henry’s first guest article for my blog. Folding bucksaws are a simple means of taking a large saw with you on a trip. Quick to assemble and neat to carry in a case or pack, this size of saw is a natural partner to an axe. Folding bucksaws can be packed neatly into a back pack, canoe pack, onto a snow machine or dog-sled, even onto a horse pack, or slotted out of the way in a vehicle. 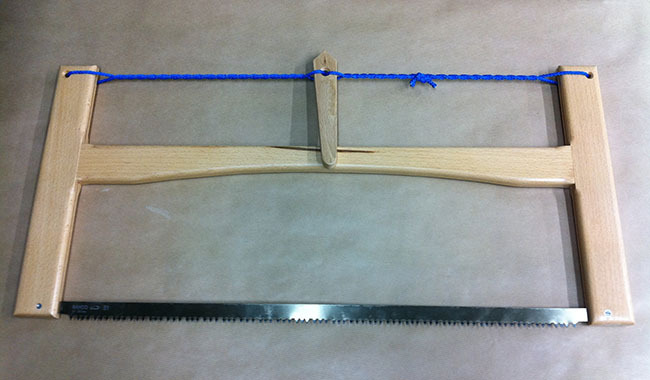 In constructing a folding bucksaw, the aim is to create a solid frame that can be adjusted to create the right tension for the saw blade but easily collapsed for storage. Many different designs have been used to achieve this aim, using either wood or metal folding frames. My personal preference is wood; some metal frames may be lighter and less bulky but made correctly wood is just as strong and possibly more durable. Despite its great utility, the bucksaw adds weight to your equipment. There are methods of creating a saw frame while in the woods. 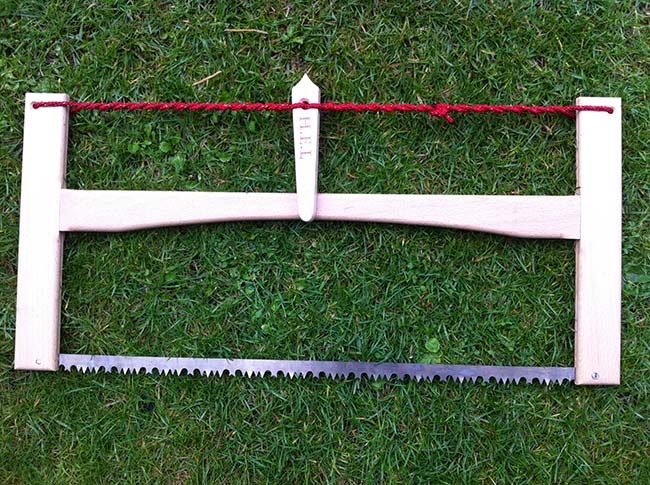 One of my favourites is to heat-bend a sapling and insert the blade to create a bow saw. Being able to create the frame in the field means you can carry just the saw blade. One way to do this is to coil the blade up in a billy can. Despite this method, if you are travelling from place to place with the need to saw significant amounts of wood on a regular basis, the folding bucksaw is a perfect companion. Also if you are intending to stay in the woods for an extended period of time, pre-making a durable saw frame is preferable to fashioning something makeshift and with a relatively limited lifespan. To start with, a warning: The construction of this version of bucksaw is not a free-hand carving project. It would be hard to make a good one just using hand tools. As I alluded to above, there are versions of this design, created more simply, which may be made in the field. The machines I used to make the saw were as follows: table saw, band saw, bobbin sander, disc sander, pillar drill and a table router. I also used a spray with a gravity feed and a spray gun. Not all these machines are essential, apart from the table saw. The bucksaw blade supports require a slot to be cut in them to accommodate the blade when the saw is folded. Other than the table saw, I can think of no way of producing such a clean slot in a blade support made of a single piece of wood. However, if you were to make the blade support in two parts and create the slot by adding a part-width spacer to separate them, this may work. The first element of the saw to be made was the windlass. This was created by cutting a piece of beech to the right thickness, then drawing on a template for the outside edge. The shape was cut using a band saw and finished by hand with 120 grit sand paper to round off the edges. Then 320 grit to smooth off all the surfaces. After this, a hole was cut using a pillar drill. The hole could be cut with a hand drill but this is hard to keep the hole at 90 degrees to the surface. Once the hole was drilled in the windlass, a countersink bit was used to round the edges of the hole. This was done as this hole, and the holes in the top of the blade supports, have a piece of cord passing through them; in order to stop wear on the rope, all the holes were countersunk. The next element to make is the main support. This runs from one blade support to the other and has to be exactly the right length for the blade. To make this part I cut a length of beech to the right thickness and height, then to the right length. Next I drew on the outline of the curve and cut this using the band saw. 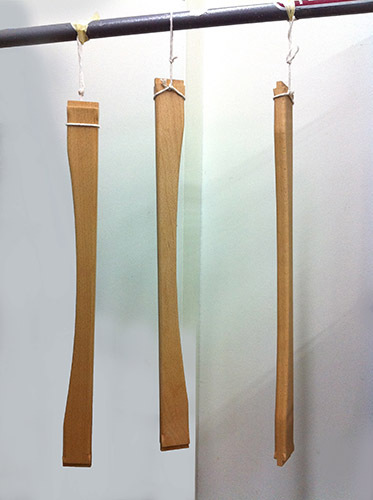 Three bucksaw main supports in various stages of completion. I then used a flat top blade in the table saw to make the tenon joint ends to fit in the blade supports. To finish the main support I used a rounding bit on the table router to round off the edges evenly. Tenon joint ends of bucksaw main support. The last parts to make are tricky; these are the blade supports. Their basic shape is made in the same way as the rest of the frame, thinned on the table saw then cut to length. If you have a mortising machine, then you can use this to make the holes for the main support to fit in. I used a chisel, which takes longer. A mortise groove cut in one of the blade supports. Once the mortise grooves for the main support are in, a slot needs to be cut for the blade to fold down into, so that the two blade supports accommodate the blade. This was made using two different thicknesses of saw blade on the table saw – a 2.0mm blade and a 3.2mm blade. The 3.2mm blade is used first to cut the main slot for the bucksaw blade to fold into. Then the 2.0mm blade cuts the thinner slot where the bucksaw blade attaches to the frame. The main support and the two blade supports fitted together. Next come the holes in the blade supports, whereby the saw blade is attached to the frame. Again these were drilled with the pillar drill. The positioning of these saw holes is critical. I used a 7mm bit for the saw holes, then tapped in a brass insert for an M5 bolt. The positioning of the holes for the cord is less critical but it is best to mark them up to keep them even and not too close to the edges. The M5 bolt I cut to length and notched a grove in with a hack saw. Then I filed the blots flat. The last part of the saw support is to finish them on the table router carefully stopping before the tenon joint locations. The final assembly of the saw is quite simple: Position the bucksaw blade in the slots of the blade supports, in line with the holes, and screw in the bolts carefully at both ends. Then use some 4mm cord to thread through the windlass and both blade supports and tie off with a reef knot in the middle. Remember to burn the ends to stop fraying. 1,3 & 5: Herbert L. Edlin 2002 What wood is that? 2: Thomas Corkhill (1989). The Complete Dictionary of Wood. Nice article again, but why not make it in the field ? Wood enough …. Sure there are many ways to make an effective saw while in the woods, starting only with a saw blade. That’s not what this article is about. It’s about making a really well-finished tool before you go out. In the article Henry explains why he didn’t make it in the field. I’m a little uneasy with the ethics of showing how to ‘clone’ what looks very much like the Chris Boyton / Woodlore folding buck saw, but on the other hand bucksaws of this general design have been around for hundreds of years now. However I ought not to let this detract from what is another very good article. Congratulations Henry, fame at last 😉 I particularly liked the inclusion of the details about the character of the beech wood you used to make the saw. A folding bucksaw like this certainly is a fantastic tool to have with you in the woods. I certainly use mine quite a lot both on ‘Bushcraft camping trips’ and when I’m working as a volunteer in my local woodland. A folding saw is much easier to carry on my journey to the woods by motorcycle than a fixed bowsaw! As always it’s great to hear from you. In no way do I want this blog to infringe on anyone’s intellectual property rights. Nor do I think this artcile does. As you say, this design of bucksaw is indeed an old one. And you only need do an internet search on ‘bucksaws’ to see plenty of examples. I don’t see any moral or legal differernce between an article on how to make this style of bucksaw and an article on how to make a bow-drill set. There are often bow-drills for sale on ebay…. There are about a dozen saws of that basic design in my late grandfather’s garage, stuff he probably acquired from his father. I think it would be easyer to lay claim to the idea of metal saw blades than the design of that buck saw. You may as well try to re-patent the wheel. Nice try though. There are about a dozen saws of that basic design in my late grandfather’s garage, stuff he probably acquired from his father. I think it would be easyer to lay claim to the idea of metal saw blades than the design of that buck saw. You may as well try to re-patent the wheel. Nice article. P.S. I forgot to add that I’ve found that putting a slight chamfer on the corners of the mortise makes assembling the saw with cold hands much easier. This is great, im a finishing carpenter, so got all the tools needed. Yep you should make one in no time then! Did you buy that axe in the end? The two will work nicely together…. Ya that Wetterlings Axe will be a great pair to have. Still haven’t picked it up yet, sigh..lol. But this will make a great project, i enjoy building stuff like this. I have a Bahco blade for mine so hopefully I can get myself an efficient wood bothering device made at some stage. Thanks. It’s that bushcraft ESP thing going on again…. Go for it and let us know how you get on – send me a picture when you are done. Nice article, nice saw. There aren’t many people in the world who are going to go to the trouble to make one of these so I think Chris Boyton’s living is safe. For those that do, I think they will get a great sense of satisfaction from it. The issue would be someone using the Boyton pattern to mass produce a knock off and severely undercut him price wise. But then, you wouldn’t be buying a saw made by a craftsman and for people in the market for a cheap (and serviceable saw) they might as well buy a Bahco bow saw. Am I making any sense? 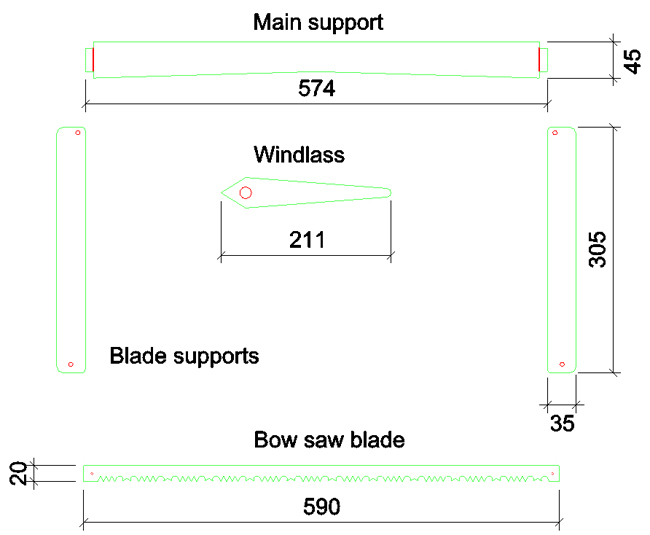 There seems to be one critical dimension not shown on the drawing – the position of the main support along the blade support. Yep you are making sense and I agree with you. Henry – can you provide this missing dimension for the saw that you made? The important thing is that the windlass sits well on the main support when the saw is tightened. Very enjoyable article. Good bucksaws can be very expensive. High quality at a fraction of the cost. What could be better. Indeed Ian, high quality bucksaws can be expensive. Also, making something of your own is very satisfying in its own right. As I read this I was thinking that the article would get a lot of snooty comments from the ‘oh so worthy and right-on brigade’ because it is not strictly speaking a ‘crafted in the bush’ tool. My answer to that would be well, was your axe head made in the woods, or your knife or your lovely new gore-tex jacket? Happily the quality of comments so far shows what a well adjusted bunch subscribers there are to this blog. Most it seems, appreciate there is a time and place for traditional ‘bush crafts’ and also a place for modern techniques and tools. After all, we are not living in a vaccuum and I’ve always seen this pastime as a fusion of past and present. Skills are skills, and they are all useful. I have made a vitually identical bucksaw before with just a folding saw and a knife and I don’t have half the tools mentioned here; but I can certainly think of ways around that to end up with the same result with what I do have. I for one welcome more articles like this. Well done. Good points and well made. There are indeed many ways to skin a cat. There also seems to be an increasing interest amongst those who enjoy bushcraft to make – or at least make parts of – their own tools. I think Henry’s article helps with people’s understanding of how to do just that. I think it *can* be made without the powertools. One way would be to saw it (e.g with a dovetail saw, two parallel cuts), and then using e.g. a router plane to even it out. Or even just a file with the handle taken off. A plough plane with a sufficiently narrow blade is of course even better, and is actually designed for just this application (a narrow slot parallel to an edge). The rest is, of course, trivial to do without powertools. I’ll try it in a couple of weeks when I can get to my tools next. Please let us know how you get on with your hand tools, particularly with the blade recess in the blade supports. Another quality article , detailed instructions and good photos. ‘Handmade’ tools are very special they evoke memories of where and when they were made. I made a Bucksaw , slightly more ‘rustic’ than this one, based on a Mors Kochanski model.Very useful and personal to me. Stop ripping off Woodlore and do something original, Paul. This is not abusive, it’s just plain common sense. All you are doing after leaving Woodlore is taking their content and re-hashing it. That is really unethical and I would not want to be taught by someone who would do that. Get your facts straight Simon. This design is as old as the hills and Woodlore’s version is no more original than the one that went before it. Unlike your boss, you don’t know your subject. The question that anyone reading this should ask is why does Simon care so much about Woodlore? Why does he feel so threatened by someone making a saw similar to the one that Woodlore sells? You should also ask why Simon uses a proxy server to hide his real IP address (and location) and why he uses a bogus email address? Why is he afraid of us knowing his true identity? Simon, your writing style is so easy to recognise, you might as well have signed off with your real name. Have a look at the content of Mason’s ‘Woodcraft and Camping’ and Stewart’s ‘Indian Fishing’, then have a look at the content of a Fundamental Bushcraft course. We should then have a discussion about originality. There is nothing unethical with standing on the shoulders of giants. It’s just that some of us aren’t afraid of showing it. Please don’t leave any more anonymous messages on my blog or on Frontier Bushcraft’s blog pages. I am probably misquoting horribly, but ‘all art is derivative’ or something like that. Paul is a big boy and can look after himself, but what you are saying is not fair. Paul has invested a lot of time and a huge commitment to learning from experts and he is now teaching in his own right and under his own name. A good student will extract something from each of his/her teachers and form a synthesis of their own. They will add value with their own unique experiences when they pass it on to their own students. It’s also not just about content or subject matter but about your teaching style, communication skills and a degree of interpersonal chemistry. Whilst one expert may be the ‘go to guy’ for a particular skill they may be just not be very ‘user friendly’ and therefore not be able to pass it on very effectively. Students should have the freedom to choose the teachers that they respect and enjoy learning from. I am sure that this will happen in Paul’s case. Give me a break. 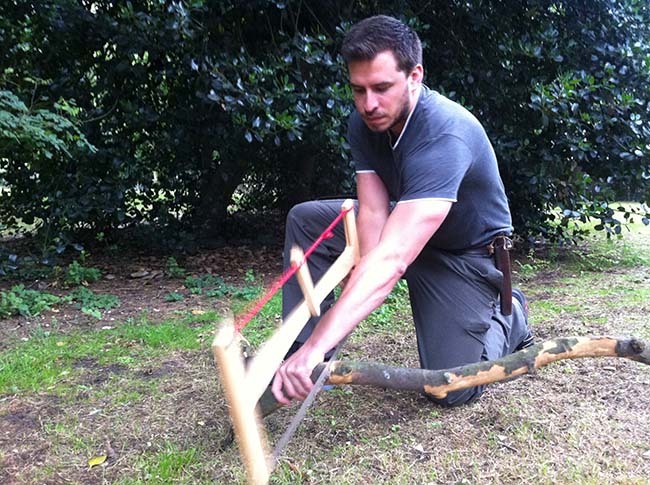 Woodlore invented the bucksaw? Get off your high ground Simon. In fact I’m glad he posted this. Just because it has the Woodlore name on it, they can charge 230 dollars for it? Paul showed us how to make one for 30 dollars worth of materials and some know how. Hi Paul, do you think you can post some images of how the blade itself is mounted to the screws so that it rotates? I love your saw. Forget all the haters that say this is a copy or knockoff. Those people just don’t get it and are probably just jealous of your skills. I saw this is awesome. Hey Paul, anything you’d change about the design at all having now had a chance to use it for a few months? Would you put he main cross bar lower so that you can get more tension? Different choice of woods? Are you happy with the size and hence the grip you have on the blade support members? Thanks Paul! I’m pretty happy with the design. I wouldn’t want the position of the cross-bar any lower as this would reduce the maximum diameter of trees or logs you could saw with it. You can get it plenty tight enough as long as you make the thing to the correct tolerances in the first place. The size of grip is fine too although could be made a little deeper or wider if you wanted them to be. Beech seems a good choice of wood so far. Probably just as well “Simon” because with that attitude you would not learn anything from anyone !! What are you so scared of ? Just because charge £140 for what is being shared for free here is no reason to have a tantrum, is it ? Great designe. Is it a bucksaw or a folding bucksaw. And if it is the last one, how do you fold it???? Yes, it is a folding bucksaw. The pins/screws where the blade is attached act as hinges. Firstly i must say thanks for writing the blog and look forwards to doing a course with you in 2013. With regards to the saw in what respect does it fold im trying to picture it, i was under the impression the blade was unbolted and stored as a separate part. Does it fold into the wood work in a similar way to the laplander or swiss army knife. It was an oversight of mine not to put a photo of how the bucksaw folds in the article, yes it does fold in to the wood work like a Laplander. The two blade supports have a groove cut in to them with a table saw, the blade is fitted on a threaded bar which allows it to pivot in to the wood work. Thanks for your comment and I look forward to meeting you on a course in 2013. I think Henry has answered your question but if you have further questions, please just ask. I do not know whether it’s just me or if everyone else experiencing issues with your site. It appears as if some of the written text on your content are running off the screen. Can someone else please provide feedback and let me know if this is happening to them as well? This could be a problem with my web browser because I’ve had this happen previously. I’m sorry to hear you are having such problems with the text. It is not something I have noticed. Which browser are you using? I have recently made a folding bucksaw with minimal tools, laplander saw, axe and fixed blade knife. Ok doesnt look pretty but is quite possibly one of the most useful tools i now own. Its a pleasure to use and makes life so much easier. So i would just like to say a simple ‘Thanks’ for posting this. Thanks for your comment. It’s great that you have made such a useful tool. I seriously doubt that there is any infringement of design going on here. These types of saws have been around for such a mighty long time. Similar saws were (or still are) used by some woodworkers, especially continental woodworkers. They aren’t really folding Bucksaws but the design and principle is exactly the same, down to the windlass – although some now employ a metal threaded rod. They go under a few names – Bow saw, Turn saw or more often Frame saw. The difference between these type and the typical Bucksaw is that the blade can be turned or swiveled, allowing an infinite depth of cut. The blades are finer toothed, although some might be able to accept a Bahco type peg toothed blade. ECE in Germany still make such a frame saw. Forgot to add: You have used mortice and tenon joints in the construction. That makes it an upper class buck saw 🙂 Whilst I’ve made woodworkers Frame saws I’m tempted to make a Bucksaw for cutting firewood logs. Thanks for your comments Michael. Much appreciated. Please do let us know if you make one of these. Nice video, we tend to lean towards maple in our bow saws here in Northern Ontario. Yes, it is a bit heavy but very tough, readily available (buy or harvest yourself) and lasts forever. One addition is to incorporate 1/4 ” threaded rod with washers and butterfly nuts as a replacement windlass and cord. well, not as a replacement but backup. Only mod. is to drill 1/4″ cordage holes 90 degrees to the current ones. I enjoy all info you share and Paul there will always be naysayers jealousy, insecurity whatever. KEEP UP THE GREAT BLOG, VIDS. AND ARTICLES. Maple is a very tough wood, and yes also a bit heavy. I have used seasoned maple for other projects, and it is a strong wood that takes time to work. Never the less, the work put into maple as you say is worth it because of how long it lasts. The use of a threaded rod is a good one, I’m sure it allows very fine tuning of the blade tension. Having both methods of tensioning at a fixed camp gives you options, although it is one more piece of kit to take with you on an expedition. I see Henry has already replied to you but thanks for you kind feedback. Thanks for reading! I made one of these last year using your instructions, and it turned out lovely, it’s packs down well and makes short work of bigger pieces, beating the axe in speed and expelled energy. its made it in Oak, it’s solid and, it’s beautiful and easy to use. I made a leather sleeve to keep it neatly together, and to keep the blades from cutting through when packing it for a trip. Thanks for your comment, I so glad you have made your own buck saw and I hope the instructions helped. The saw is in some cases a far more effective tool than the axe, and as you say conserves time and energy. Oak is a good choice of wood for the frame, a bit on the heavy side but tough as old boots. The leather sleeve is an important addition, you can feed the saw down the inside of a back pack without too much difficulty, but there is always the danger of it cutting vital kit. Hope your ok. I have made my own folding buck saw many years ago and have found it a perfect partner for my axe. I’ve been a student of Bushcraft for around 25 years and would be honoured to be taught by you. And there are those who need to remember that all teachers where students once and that Bushcraft and wilderness skills can take a life time to learn and then some. Thanks Adrian. There is always more to learn about nature and there are always more experiences to be had. As soon as anyone stops considering themselves a student, they close off their mind. The saw i made uses an 18″ Bacho saw blade and has kept me in good stead. The diameter of timber that you can cut with a bow saw (particularly if it is improvised) is to a large extent determined by the length of the blade. Buck saws on the other hand, due to their rectangular shape tend to be less dependent in this parameter than bow saws. So if you are carrying a blade with the intention of making a saw in the field if necessary, the type of saw you intend to make has a significant bearing on the decision of what length blade to carry. The other factor is efficiency – a longer blade allows longer strokes if you use the full length of the blade, which is more efficient than short back and forth strokes with a shorter blade. For most firewood you might split with a small axe, however, the difference between 18″ and 24″ saw is not limiting unless you head to the far north. If you are felling larger trees for firewood – either for a stove or for a long long fire say – then you may want a longer blade/larger saw. Either that or fell the tree entirely with an axe (which is somewhat more risky). i did a booboo apologies everyone. Not use to doing it with me phone,sausage fingers. Thanks for your feedback on Henry’s article. I hope it proves useful to you and your brother. Let us know how you get on with your project. Great aticle. I am busy making the wooden parts for the saw but I am waiting for a blade. What is the distance between the blade hole entres or what length are the tennons so I can get on with making it before the blade arrives? I an see the overall length of the midle bit is 574mm but how long are the tennons cut back on the end? 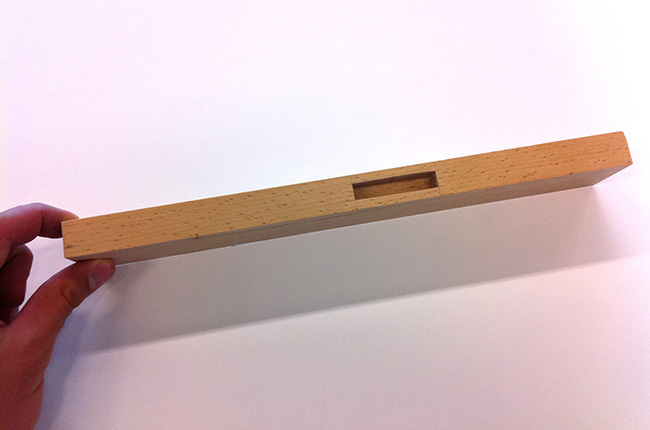 The tenons are 8mm each side, you can make the wooden body of the saw without the blade. Just hold off on drilling the holes for the location pins until the blade arrives. Also check what size blade you have on order fits the design you are making. Thanks very much for a great article. I started making folding bucksaws a couple years ago using this and other articles. After making a few (and tweaking each subsequent one) I’ve found a persistent problem that I’m hoping you could shed some light upon. I’m experiencing cracking at the point where the cord passes through the blade supports. More specifically, when the windlass is engaged and the cord is twisted, the cord squeezes the blade supports so hard it eventually forms a crack in the blade support at the ‘bottom’ of the channel. I’ve been using red oak as it’s what I have on hand. Have you had this problem? If so, any suggestions on dealing with it? I’ve seen a couple examples of folding bucksaws in which the blade stores in the channel teeth-down. This means the cord must be removable from one of the blade supports to accommodate a 270 degree swing. (does that make sense?) That design would solve the cracking problem because the twisted cord would not squeeze the support at the groove. But, that opens another problem because the blade is much trickier to return to storage position because the teeth grab the edges of the channel. Thanks for your thoughts on this! Love the design! Wonderful craftsmanship. Can you explain how the pivot joint for the saw works in more detail? I can visualize it, but I can’t see how you could replace the blade easily if needed. Thanks a bunch! I can’t take credit for the design, it’s a very old one. The craftsmanship I can though, thank you I’m pleased you like it. 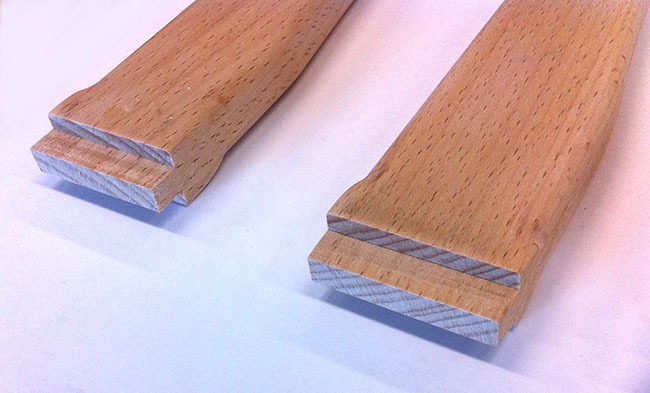 The pivot joint is a cut length of 5mm threaded rod that passes though the wood and the saw blade. At the end of this threaded rod I used a needle file to make a grove that would except a flat head screwdriver to unscrew the rod. I used a brass insert imbedded in the wooden body of the saw to add extra strength to the fitting, this is not essential. I hope this answers your question, let me know if you have any others? Great read as normal Paul. Thanks for your time. Working within our industry it’s really nice to see people raising the standards and sharing useful info. I don’t have the tools to make these saws, would it be possible to commission some to be made for our adventures? A bit puzzled by the size of the saw blade used. The drawing states 590mm. I do know only 21″inch oir even 24″ blades (metric sold as 530mm or 607mm). Is in fact the blade you are using a 21″ (i.e. 530 blade) but with an overall length of 590 or is it a 24″inch blade with an effective saw length of 590? The saw blade used is a 24″ blade. The 590mm measurement in the drawing is to the holes in the blade used for attaching it to the saw frame. Excellent saw, thanks for posting. Would it be alright to make one of oak as I am going to use old table legs. Hard for me to find anything but pine in the merchants near me. Could you do a video for youtube when you make another batch please. Oak will work just fine. HI Paul. Any ideas on carrying a bucksaw in the woods or how to make a pouch for a bucksaw. I priced a pouch at £75. I do not have any beech wood available, but I have plenty of ash. Would this make a reasonable saw? Thanks in advance! Nice to hear from you. Yes, ash will work well.